Join our friend as he prepare his journey to get back home in FarmVille Ride into the Sunset, a Castle Kaputstone Chapter 7 Quests. Dr.Kaputnik has tremendously help made his dreams come true. So let’s prepare for our trip. 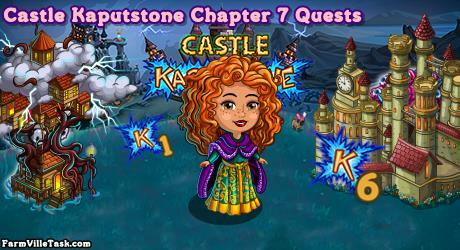 In this chapter of Castle Kaputstone Quests, you will have 6 recipes to be crafted at the CRYPT REANIMATOR. Gather the bushels early sot hat you will be ready once you reach that part. Note: Expected to be release on Monday (December 3). Quest Handicap: 80 – 72 = 8 amount to harvest. Info: Crafted at CRYPT REANIMATOR and will need Skeletal Pear Bushel x9, Candycorn Grapes Bushel x9 and Webbed Strawberry Bushel x6. Quest Handicap: 120 – 1198 = 22 amount to harvest. Info: Crafted at CRYPT REANIMATOR and will need Spooked Bananas Bushel x6, Purple Poison Apple Bushel x6 and Webbed Strawberry Bushel x9. Info: Crafted at CRYPT REANIMATOR and will need Plum Bats Bushel x6, Hollow Skull Radish Bushel x6 and Franken Kiwis Bushel x6. Info: Crafted at CRYPT REANIMATOR and will need Vampie Mango Bushel x4, Poison Skull Orange Bushel x4 and Brainy Watermelon Bushel x4. Quest Handicap: 140 – 126 = 14 amount to harvest. Info: Crafted at CRYPT REANIMATOR and will need Hollow Skull Radish Bushel x9, Hollow Orange Bushel x9 and Mummified Blueberry Bushel x9. Quest Handicap: 160 – 144 = 16 amount to harvest. Info: Crafted at CRYPT REANIMATOR and will need Candied Corn Bushel x6, Vampie Mango Bushel x6 and Rice Crispy Pumpkin Bushel x6.